Land hermit crabs are very social creatures. In the wild hermit crabs live in large colonies and are commonly found piled up on one another when sleeping. For years I made the mistake of keeping one jumbo at a time. I misinterpreted the name "hermit" to mean that crabs preferred to live alone. 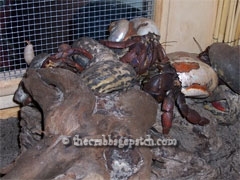 I feel badly knowing that my crabs would have been so much happier having had friends. At The Hermit Crab Patch we do not sell only one crab to customers unless they already have other crabs waiting at home. My crabs have a huge cage in which to scatter and bury yet I find them piled up high on top of each other in a favorite spot behind a large climbing branch! I was told of a couple in the Bahamas that were leaving on a short trip. They had a large unopened bag of dog food that they tied from a rafter so that Raccoons would not get into it. When they returned they found a massive army of hermit crabs devouring what little was left of the bag. The hermit crabs managed to get word out to the entire island colony apparently and through team work, piled up high enough to allow the top crab to be able to break into it and everyone enjoyed a free lunch! It is fascinating to watch crabs re-establish their social hierarchy when introducing a new crab into an existing "crabitat". Usually an existing crab will come over to the new guy and an "antennae war" battle will ensue. This is often accompanied by leg sparring matches as well. Whichever crab is able to keep his antennae up the highest becomes the new "alpha" crab. It is very entertaining to watch if you know what to expect. For a new crab owner that has not witnessed this behavior before it could be upsetting. You think that by providing a new friend, your existing crabs will be happy and instead it appears that everyone is agitated and fighting! This is normal behavior in a social crab colony. They always work it out and once the new pecking order has been re-established life can go on as usual. The general rule of thumb when deciding upon how many crabs to have is the more the merrier. Before you go out and rescue every crab in sight, keep in mind that your cage/tank surface area must be able to accommodate all of your crabs molting safely as well as allow room for two water dishes, a food dish and things to climb on and hide under with room left over to be able to roam, sleep and play. For a 10 gallon tank that may be 10 tiny crabs, 6 small crabs or 4 medium crabs or a reasonable combination of the above. You can keep hermit crabs of different sizes together as long as your substrate depth accommodates your largest crab being able to completely bury when he needs to molt. Very tiny crabs are better kept with crabs closer to their own size because jumbo and large crabs can tend to be a little clumsy and might accidentally break tiny legs. Large and jumbo crabs cannot be kept in a standard 10 gallon tank because it is not deep enough to hold the 8-12 inches of substrate depth needed to molt. Your crab cage will be more active with several or more crabs, but at the very least do not have less than two. Hermit crabs make a noise referred to as stridulating. It is similar to a croaking or chirping and depending on the size of the crab will vary from a high pitched and fast cadence for tiny crabs to a low, steady and surprisingly loud at times sound produced by Jumbo crabs. It is still a mystery as to how exactly the sound is produced. Hermit crabs will make this sound when agitated by another crab as in the case of a fellow crab attempting to rock the croaking crab out of it's shell to steal it. Crabs may also croak in irritation when another crab bumps or walks across it or if picked up by an owner when the crab is not in the mood. It is definitely a sound made in response to irritation and acts of aggression. Males and females tend to have similar temperaments for the most part and can be kept in any combination. Males do not tend to fight anymore readily than do females. Males and females kept together will not breed according to most experts. Last summer one of my female pets that I have owned for over 9 years surprised me with eggs. I was excited, thinking that since she had been inside in a cage that I might be able to prove the experts wrong! As the weeks went by, her eggs remained a bright brick red color instead of changing to a pale, rust and then on to dark gray as the developing zoea depleted the yolk supply. I suspected that I had infertile eggs on my hands and was able to remove one to examine under my microscope. Sure enough they were pure yolk! She ended up burying down to molt soon after and apparently dropped them. So, at this point in time I will have to agree with the experts that captive hermit crabs kept indoors in a cage will not breed, but they can however still produce eggs. My theory is that the moon cycles play an important role in the actual breeding process since I have had pregnant females in my large outdoor cage. It could also have to do with cage size. Maybe my outdoor crabs did not perceive themselves to be captive and they certainly were not overcrowded in my 8'x8'x6' outdoor cage.